Comal de fierro Redondo #1 / Round Skillet Comal #1 - Metal Plate Griddle - Diameter 8 1/4"
The comal is a cooking utensil that no authentic Mexican kitchen can be without! 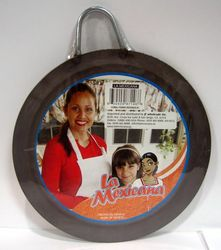 La Mexicana brings you their quality Round Skillet comal, which is a round, shallow cooking pan. Also known as skillet, this cooking tool is used mainly to bake or warm up tortillas, quesadillas and even to blister chiles for use in salsas or dishes with stuffed or sliced chiles. Its practical small size makes it perfect for your stove top, if you do no want to buy a big comal this is the one you need! It will not occupy a lot of space on your stove or in your pantry! Learn all you need to know about Tortillas and preparedeliciously authentic Flour Tortillas with MexGrocer�s Mexican recipes. Descubre todo lo que necesitas sobre las Tortillas y aprende apreparar autenticas �Tortillas de Harina con las recetas Mexicanas de MexGrocer. Secalo de inmediato con una toalla de cocina y no guardes el comal mientras este mojado. Will use no other pans! Not sure what I did before finding these skillet/griddle pans. I now own two of them - one small & one large. Easy to clean & care for, quick heating, convenient for everything you could possibly think to use it for. I quit heating things up in the microwave since I own these two pans. You won't regret owning one.